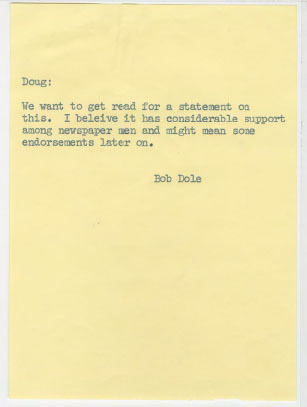 Correspondence between John H. Colburn and Congressmen John E. Moss and Bob Dole about S. 1160 and Dole's bill, H.R. 12160. Colburn is writing as Chairman of the Federal Laws Committee of the American Newspapers Publishers Association and Editor and Publisher of The Wichita Eagle and The Wichita Beacon of Wichita, Kansas. Colburn, John H. "Correspondence Between John H. Colburn, Congressman John E. Moss, and Congressman Bob Dole." Robert J. Dole House of Representatives Papers, Box 189, Folder 1, Robert J. Dole Archive and Special Collections, University of Kansas. Accessed 19 April 2019. http://acsc.lib.udel.edu/items/show/372.